The SEA Games are the Southeast Asian Games which happen every two years in November for about a week. Only known in this region, it is a great advertising opportunity for businesses, with many companies paying heaps of money to make ads on TV and in magazines to publicise their businesses. Some others conduct quizzes in the newspapers and on mobile phones. Everybody tries to make some profit from the interest in the games, by standing along main roads selling flags, hats, head bands or make up for fans. The best time to wander around is after Vietnam's victories in the football competition. 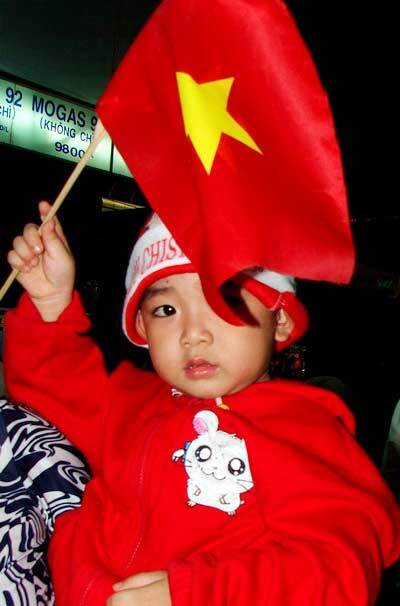 You'd be surprised about how crazy the Viet fans are about football. 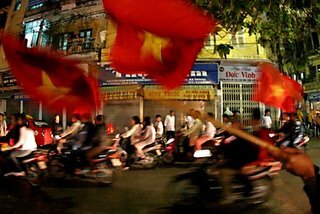 They ride around shouting "Viet Nam Viet Nam"- "Vietnam Vô Đich"(Vietnam are champions!) or shouting the goalscorers' names till 1 or 2 am non-stop. 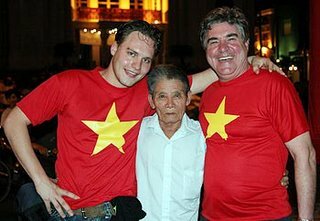 This is an exciting time for foreigners and most of them can't believe that Vietnam is so crazy about football. Last night, the SEA Games concluded and the highlight was that the Vietnamese national womens' football team scored the hat trick of three gold medals in a row. In total, Vietnam won 71 gold medals and finished third on the medal ladder. Once again, the male football team lost in the final to Thailand. 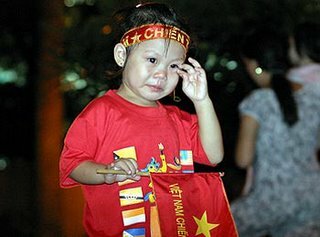 Even though they lost, Vietnamese fans still hung around the streets, some very upset. 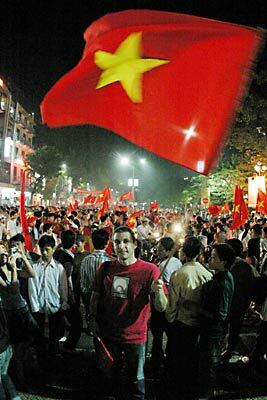 You may see me sometime in that big group in the Vietnam red T-Shirt with the yellow star, just because I am a normal Vietnamese who loves watching, supporting and celebrating my national sports teams achievements. I love your blog. I'm glad an asian blogger makes it to the "Blogs of Note". Anyway, your blog inspired me. I hope my blog will become as enriching as yours. Also wanted to drop you a line and tell you that you've got a great blog. I've encouraged my own readers to check it out. Your blog is great! Even though I can't think of eating dogs or cats meat :) ! Carry on telling about your beautiful place, it's very interesting. I'd like to visit it one day. Ball is the god of many in the americas and of Europe as well. Love the blog... it's good. Agree with Jher. Nice to see an asian blog make Blogger's Blogs of Note. I just found your blog--it's really fabulous. So glad to see an Asian blogger get noticed. You've got a great site here--keep up the good work. I was surprised about being on Blogs of Note. I hope everybody keep coming back to my blog to read my posts about Viet Nam and Vietnamese life. your pictures are impression, I like it so much, I like your article, too. I hope that I'll do that in the future.